Hans Petter Moland is a peculiarity: a Norwegian born and based filmmaker of unmistakably American genre sensibilities. His 2014 film In Order of Disappearance was a darkly comic western revenge flick with more than a little of the Coen brothers about it – not least in the character played by Stellen Skarsgård, who roamed the snowy wilderness like an angel of death on his demonic snow plow. On the evidence of his latest effort, titled Out Stealing Horses, the director has not lost that taste for baroque imagery and storytelling. Skarsgård once again stars here, however this time as an elderly man, rife with regret and daddy issues, reminiscing about the tragedies that befell his neighbor’s family – and subsequently his own – just after the end of the Second World War. The film skips fluently between these two time periods: a nostalgic pastoral of 1948 Norway and the winter of 1999. It’s largely a coming of age tale for Trond (played as a boy by Jon Ranes) and Moland gives weight to it by peppering the boy’s forming years with biblical leanings. 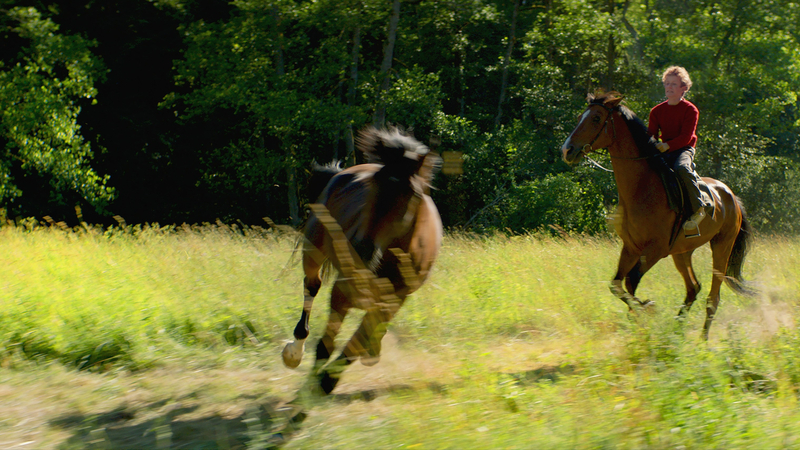 Horses begins with the older Trond retiring to his childhood home where he bumps into Lars (Bjørn Floberg), the last survivor of his neighbor’s family. The meeting reopens old wounds. “I have been lucky” Skarsgård intones to the viewer in one of his numerous richly voiced narrations. We can presume Lars has not. The many ways in which Lars has not provides the drama of Moland’s novelistic film. He is the Cain to his brother’s Abel, an accidental shooting that leads to a series of grim tragedies. Moland is telling a tale of paradise lost but Horses is perhaps less remarkable for its plot than it is for its style. Working with cinematographers Thomas Hardmeier and Rasmus Videbæk, the director has created a world of encroaching malevolence here, a fractured Eden where everything from the corn fields to the ants seem possessed by some unseen menace. The mere creaking of Trond’s father’s lumber portends many a tragedy to come. The director expertly peaks this audiovisual malaise during a marvelous set piece late on when a pile of that very lumber, stacked like a game of KerPlunk in the middle of a river, threatens to relieve Trond of his cranium. The film’s title is a direct reference to a piece of code used by resistance fighters during the Nazi occupation of Norway and Moland takes his narrative to that time to add even more to the broth, which is well seasoned but ultimately a little short of substance: Trond’s father (Tobias Santelmann) may have helped the resistance but was he an ineffective father? That kind of old school heroism has yet to lose its allure at the movies but the ideas contained about masculinity are at best outdated and at worst quite damaging. Still, Moland’s films are nothing if not trilling and his latest casts an enticing hook that should keep the viewer on board for its not particularly swift runtime.